Fiji is an archipelago of more than 332 islands, of which 110 are permanently inhabited, scattered around the reef-strewn Koro Sea in the southwest Pacific Ocean. The majority of Fiji’s islands were formed through volcanic activity starting around 150 million years ago. The population is 50% native Fijian and 45% Fijian Indians. In the heart of the Pacific Ocean, Fiji is the perfect place for an unforgettable holiday with some of the most famous white sandy beaches, pristine reefs and great flora and fauna. The first settlers of Fiji arrived around 1500 BC. The history of Fiji and its first inhabitants remains something of a mystery prior to this, as the Fijian people depended on memory in the absence of written language. However, it’s widely agreed that two distinct groups of people, the Melanesian and Polynesian, first settled Fiji, and today, those enjoying holidays in Fiji are more interested than ever to learn about these peoples and their influences. Naqalia Lodge is a dreamy location for both weddings and honeymoons, an amazing challenge for eco-lovers adventures, and for sure a once in a lifetime holiday for anyone who loves to relax and escape from their every day life. Naqalia Lodge is a charming and traditional community-owned resort located on the little island of Wayasewa (Wayalailai). The Tagova Clan built the lodge using local artisans, for the purpose of sharing their beautiful and pristine area with visitors from all over the world. Naqalia Lodge is found in a secluded Fijian landscape with a magnificent volcanic backdrop and palm-fringed white sandy beach. It is possible to snorkel in the turquoise water, where the pristine reef and the vibrant marine life await you. For the more adventurous there are natural forests for hiking, the ocean for free diving, cave diving or kayaking and plenty of other activities. Or just feel free to laze on the beach enjoying the tranquility, panoramic views, traditional hospitality, and Fijian style cuisine, courtesy of your Naqalia family! Naqalia Lodge is the perfect place for your honeymoon, your Fijian style wedding, an adventure trip enjoying the water activities or just a relaxing experience surrounded by the Melanesian culture and tradition. Various accommodations for any needs. 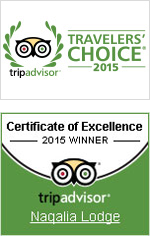 Choose the best option for a memorable holiday. 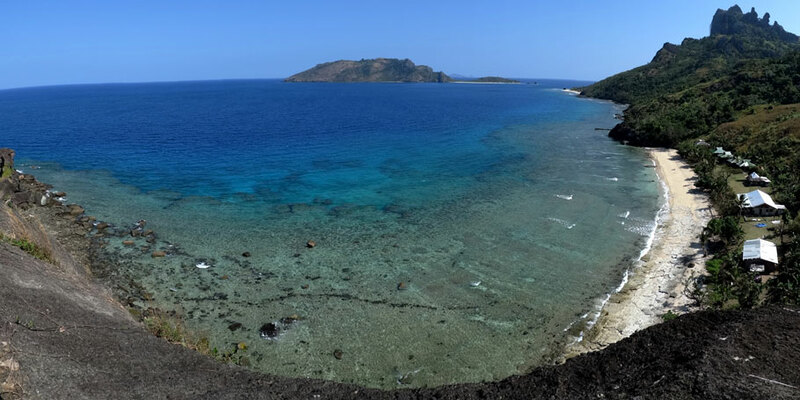 Diving in Fiji offers the Scuba Enthusiast a combination of the most dramatic vertical wall terrains, colorful coral (hard corals, soft corals, brunch corals etc. ), a lot of different kind of sharks and a large variety of tropical fishes! In addition, there are the most optimal scuba diving conditions in the World: visibility’s of greater than 100 feet and average “in the water” temperatures of 83 degree. Around Wayasewa island there are over then 30 different sites where you can experienced different kind of dives: cave dive, drift dive, sharks dive, deep dive and more. 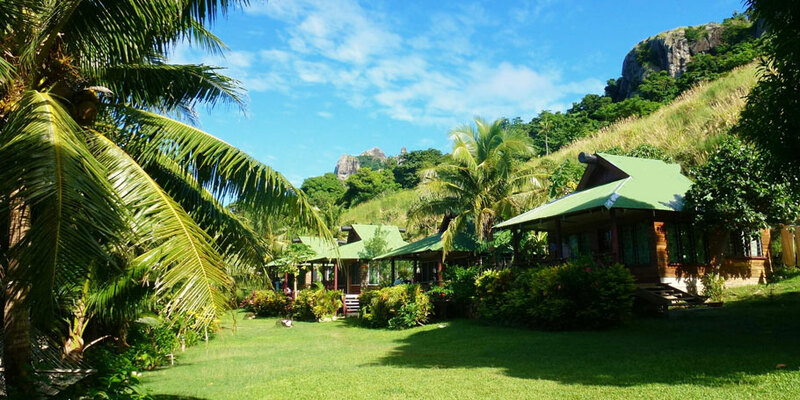 Naqalia Lodge is affiliated with Tropical Yasawa Diving Centre that with their professional guided will make you enjoy the beauty of our pristine reef. 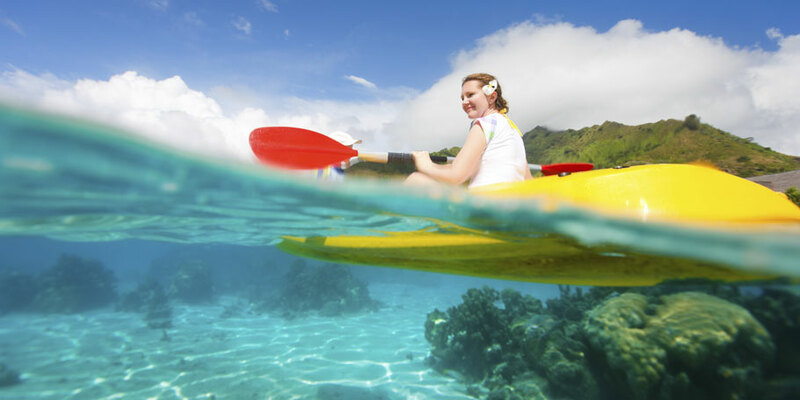 Kayaking is one of the greatest ways to explore and discover the beauty of Fijian nature. Kayaks are small paddle boats that are very maneuverable and can be navigated through very shallow waters. This allows the paddler to be able to access spots that are out of reach for larger motor-driven boats. 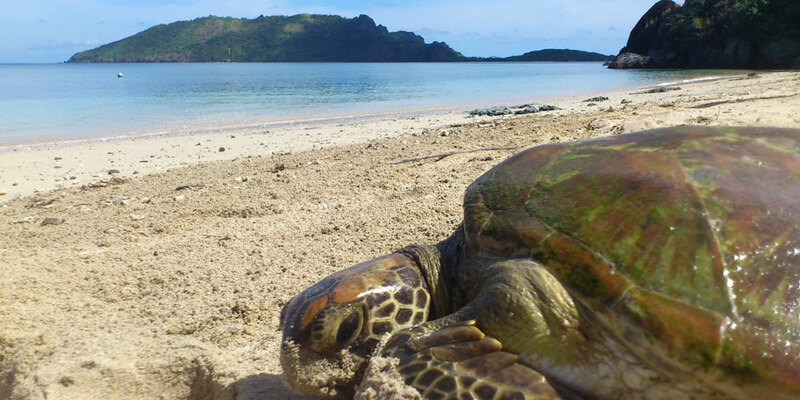 The Yasawa Islands are a sea kayaker’s delight. A region of sparkling azure waters and white sandy beaches with palm trees, beautiful coral reefs, and colorful fishes. Relax and take in the exquisite scenery as you paddle around Wayalailai with your personal guide, snorkeling and swimming in the blue water of the Pacific Ocean. If you want an extra challenge, we can arrange custom tours, where we can cover more islands using different kinds of accommodation (camping, village stay, resort) . 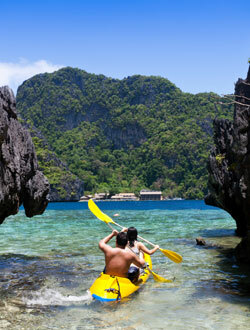 Every Kayak adventure is different and may include snorkeling, hiking and sea cave exploration. You may see tidal pools, sharks, sea turtles, dolphins, and colored fishes, while wild parrots can at times be seen flying overhead. Sunscreen . The sun can be brutal and suntan lotion is very expensive to buy in Fiji. Memories cards & Batteries. You will not have electricity all the time. Mask and snorkel. Feel more comfortable wearing your own gear. The Kava that in Fiji we call Grog or Yaqona is a root. Kava has a real important part in the social and political life of the Fijians. 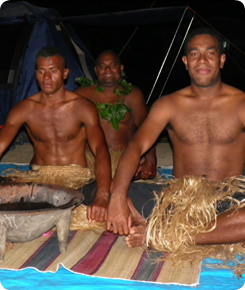 Visiting Fiji you will be involved in many Kava ceremonies, especially if you are invited to join the village life. There are a few simple rules to follow, even though the Fijians are real friendly and will explain the entire drinking process. If you are invited to a Kava ceremony, you must always answer “yes”. If you are invited in the village, please always bring a gift of Kava roots. Kava is a mild narcotic that makes you feel relaxed and your tongue will feel tingling, so don’t panic because it is the normal reaction and it is all organic! All indigenous Fijians belong to a clan which is located in a village. Every clan in the village is represented by an elder, known as a mataqali (matangali). The mataqali appoint a Ratu (Chief) or Turaga-ni Koro (Headman) who represents them in all village matters and who goes to Regional meetings with the Provincial Chief. There are fourteen provinces in Fiji. To truly understand Fijian culture, one simply must visit the Naqalia Lodge, a traditional Fijian village. Even today, the majority of indigenous Fijians still live in villages. Village life is communal and based on living and working together for the common good of all members. It’s a gentler, laid back way of life, one that’s lived closely with nature, and most villagers make their living off the land and sea. All villages have chiefs, who are the heads of their communities. When visiting a Fijian village for the first time, you will participate in a SEVUSEVU, a traditional ceremony of welcome with the village chief or host. Strangers are required to present a gift of kava roots and explain why they are there. The host then invites them to join him for a kava ceremony and by doing so, invites them as guests into his village. 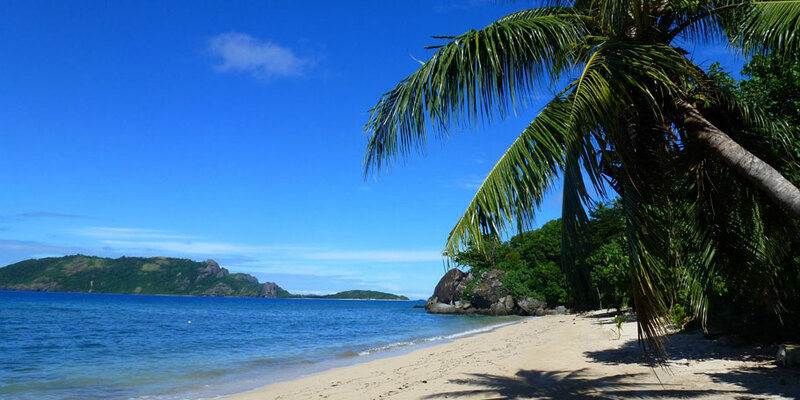 In Fiji you will generally experience a mild tropical climate. The weather varies from Viti Levu (main Island) to the Yasawas islands. 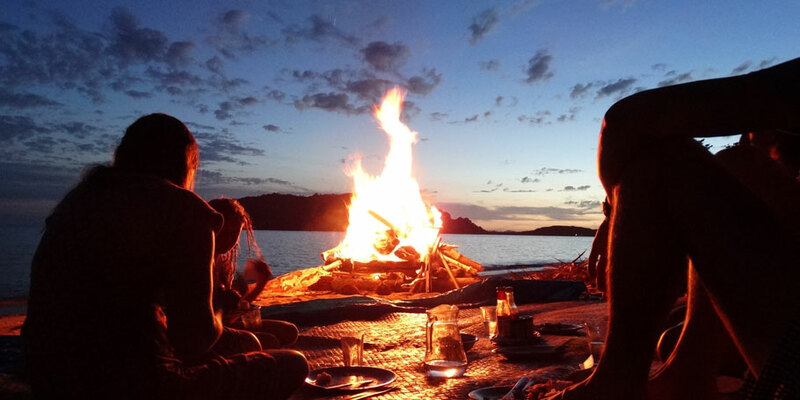 On the main island nights will be cool, perhaps 16-25 degrees Celsius with some spells of cloudy weather and rain. The days are generally hot and humid. Yasawas islands instead, enjoy hot and dry conditions most of the time, with the highest number of sunny days in Fiji.